February 21st, 2014 was a black day for Kharkov and all of Ukraine. On this day, the coup d’etat took place which was backed from the beginning by the governments of Germany, France, Poland, as well as the Democratic administration of the US. The current Ukrainian authorities are none other than those conspirators and criminals who overthrew the country’s legal president, Viktor Yanukovych. It is a fact that “President” Poroshenko was one of the founders of the Party of Regions of which Yanukovych was the leader. Poroshenko was also a minister in Yanukovych’s government. Immediately after the coup d’etat, the Party of Regions was declared illegal and disbanded. When has Poroshenko ever been honest? When he created a party that was then declared criminal? When he served Yanukovych? Or when he financed the coup d’etat in Ukraine? I’ve had the opportunity to talk with people who were once Petro Poroshenko’s business associates. According to them, he is a genuinely intelligent and experienced businessmen who indeed established a successful business. His business acumen and capabilities are undoubtable. But these same people also asserted that Poroshenko’s main, distinguishing feature is his unbridled love for money. 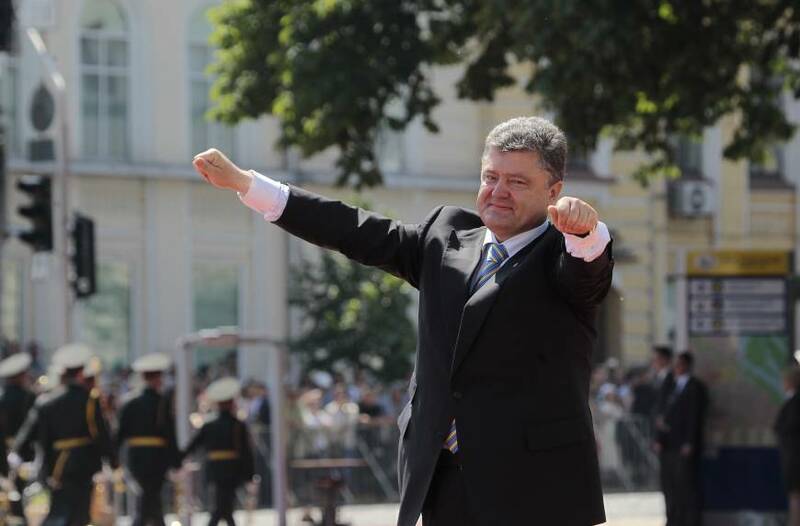 Poroshenko can make money literally out of thin air. Closed-door comments by US Secretary of State John Kerry reveal much about US involvement in Syrian crisis, Dr. Jamal Wakeem, professor of history and international relations at Lebanese University in Beirut, told RT. “I’ve argued for use of force. I stood up. I’m the guy who stood up and announced we’re going to attack Assad because of the weapons, and then you know things evolved into a different process,” the Secretary of State said in the tape. Kerry also warned the Syrians, who sounded clearly unhappy with Washington’s contribution, that attempts to intervene militarily or provide more support to the rebels by the US may have a reverse effect. RT: What do you think this conversation shows? RT: The conversation happened a few days after the US-Russia-brokered ceasefire in Syria ended. How possible is it to pursue diplomacy when one side doesn’t seem to believe in it? JW: I believe that the faction that was trying to strike a political deal with Russians over Syria was a minority in the Obama administration. It was hindered by the hawks in the US, mainly the Pentagon and the military. I didn’t believe that there would be a political breakthrough during the Obama administration, because this administration is already expired. We need to wait for the next president of the US to take over power. And the hawks in the US and also in Saudi Arabia and Turkey believe that the next president will be more hawkish than Obama and will take more confrontational steps with Russians and that is why they hindered any attempt by John Kerry to strike a deal or impose a truce in Aleppo. Maybe they wanted for the truce to be like a breathing space for the opposition or for the insurgents, but they didn’t want it to be a first step towards a political solution. And I believe that in order to talk about the political solution we need to wait for at least another year. RT: Separately, British Foreign Secretary Boris Johnson told The Sun newspaper that, following Moscow’s policy in Syria “people now believe that Russia is in danger of becoming a pariah nation”. Who are those people he’s referring to, do you think? JW: He is talking about himself, about the American administration, about the military industrial complex in the US. And about the oligarchy that is trying to impose a world order that would work for its own benefits. We need to admit that the essence of the war in Syria, in Ukraine, in Yemen, in the South China Sea is a part of a global American strategy to block Eurasia from having access to the maritime trade roots. And this was mentioned not only during the Obama administration but also it was mentioned by former scholars. It is part of the consistent strategy since the late 19th century to block any land power from having access to maritime trade roots, and this explains the policy of containment during the Cold War and later on the strategy of Zbigniew Brzezinski, the former national security advisor for Jimmy Carter, and other geopolitical thinkers of the US. So, when Boris Johnson says this he is admitting that the essence of confrontation is not between the West and Syria, or between insurgents or Assad regime, but it is between the West and Eurasia. Anyone who follows geopolitics is periodically plagued by bouts of insatiable curiosity. One really wants to know just what is being said behind closed doors during negotiations deciding the fate of the world. Retelling news from different sources is, of course, interesting, but not the point. And waiting for memoirs, which are filled with lies anyway, is long and boring. Sometimes we have the delight of published WikiLeaks that give us the opportunity to spy on American diplomatic mail and the results of the private conversations of American diplomats and their pocket politicians, but this is also not quite what is needed. Very, very rare are those leaks that allow one to really see through the diplomatic smokescreen. The New York Times’ leak of conversations between Kerry and representatives of the so-called Syrian opposition is one of these rare finds. Our media have picked up only a few elements in this leak which, undoubtedly, are pleasant for us, but these are not even the most important. Yes, during his talk with his Syrian puppets, Kerry complained of “cunning” Russian diplomats, which very much pleased the Russian foreign ministry. Yes, Kerry acknowledged the possibility of Assad participating in presidential elections in Syria despite the State Department’s official position that Assad must leave and never return to Syrian politics. This is all very good, very nice, and really is an extra reason to point a finger at the absurdity of the official American position and make fun of American propaganda. But the most important part of this leak is something else. Let’s ask ourselves two questions: Who did this leak? Why did a top American newspaper, and not RT, first publish this incriminating recording? Here begins to spin the quite interesting story which I have mentioned many times. We are witnessing a very intense conflict between the CIA and Pentagon or, if you wish, between the moderate and radical parts of the American elite. This conflict sometimes manifests itself in an intricate way. In this specific situation, it turns out that the leak’s orchestrators aimed at Kerry, but ended up hitting the whole USA. The New York Times as a newspaper is the official mouthpiece of the Clintonoids and all the American hawks. That it happily published this leak hints that such a position of the American diplomatic leadership is a disgrace for the US and that things were never and never could have been so bad under Clinton. As a result of this special operation, Kerry’s reputation has been dealt a serious blow and the American hawks have scored extra points in the fight for influencing the minds of American citizens and the undecided part of the American elite. 1. Now the US really wants to, but effectively cannot influence the situation in Syria. No one believes in Obama’s peaceful intentions, and this means that there can only be one explanation: the Americans are afraid to engage in a real military conflict with Russia. For the Americans, this is a minus, just as it is a plus for our reputation. 2. The American elite have reached such a point in their internal confrontation that they no longer hesitate to sacrifice the interests of the country in order to spite their competitors in internal political struggles. This is a very important milestone. From the point of view of old civilizations, such as the Chinese, this is a clear sign that the American Empire is nearing its end and should be treated accordingly. Now the Americans are trying to arrange another media and diplomatic show around the offensive of Syrian troops and the bombing of Aleppo. They are trying to put maximum media and diplomatic pressure on Russia. But since Kerry’s leaked confessions, no one will take this seriously. The Americans have run out of tools for directly influencing the situation in Syria, and their opinion should be ignored. By spreading media and diplomatic noise, they are trying to hide the fact that they have already reconciled with the fact that Assad is going to continue to lead Syria and that the Russian army is going to continue to use Syrian bases. All that is left is to squeeze them to recognize this not only on the sidelines of the UN, but officially. I think that our air force can handle this task. New revelations this week showing the Clinton Foundation used the State Department to find and recruit employees during Hillary Clinton’s tenure as Secretary are prompting questions from House Oversight Committee Jason Chaffetz. In a letter sent to Secretary of State John Kerry Thursday, Chaffetz wants details about taxpayers resources used to recruit State Department experts for Clinton Foundation donors and wants to know whether federal ethics codes were violated in the process. “In addition, work on behalf of the Clinton Foundation on personal time may also violate section 2635.705 of the executive branch ethics code, which generally prohibits a superior from coercing a subordinate from performing activities other than official duties,” the letter continues. Chaffetz has requested Kerry produce a number of documents, communications and a list of all individuals on Clinton’s official calendar during her time as Secretary by September 7. After the ceasefire in Syria started in late February Obama broke his pledge to separate the U.S. supported “moderate rebels” from al-Qaeda. In April U.S. supported rebels, the Taliban like Ahrar al Sham and al-Qaeda joined to attack the Syrian government in south Aleppo. The U.S.proxies broke the ceasefire. Two UN resolutions demand that al-Qaeda in Syria be fought no matter what. But the U.S. has at least twice asked Russia not to bomb al-Qaeda. It insists, falsely, that it can not separate its “moderates” from al-Qaeda and that al-Qaeda can not be attacked because that would also hit its “moderate” friends. The Russian foreign minster Lavrov has talked wit Kerry many times about the issue. But the only response he received were requests to further withhold bombing. Meanwhile al-Qaeda and the “moderates” continued to break the ceasefire and to attack the Syrian government forces. The Americans are now saying that they are unable to remove the ‘good’ opposition members from the positions held by al-Nusra Front, and that they will need another two-three months. I am under the impression that there is a game here and they may want to keep al-Nusra Front in some form and later use it to overthrow the [Assad] regime,” Lavrov said at the St. Petersburg International Economic Forum. Russian warplanes hit Pentagon-backed Syrian fighters with a barrage of airstrikes earlier this week, disregarding several warnings from U.S. commanders in what American military officials called the most provocative act since Moscow’s air campaign in Syria began last year.The strikes hit a base near the Jordanian border, far from areas where the Russians were previously active, and targeted U.S.-backed forces battling the Islamic State militants. The Russian strike hit a small rebel base for staging forces and equipment in a desolate, unpopulated area near the border. About 180 rebels were there as part of the Pentagon’s program to train and equip fighters against Islamic State. When the first strikes hit, the rebels called a U.S. command center in Qatar, where the Pentagon orchestrates the daily air war against Islamic State. U.S. jets came and the Russian jets went away. The U.S. jets left to refuel, the Russian jets came back and hit again. Allegedly two U.S. proxy fighters were killed and 18 were wounded. Earlier today another such attack hit the same target. The Pentagon does not want any further engagement against the Syrian government or against Russia. It wants to fight the Islamic State and its hates the CIA for its cooperation with al-Qaeda and other Jihadi elements. But John Brennan, the Saudi operative and head of the CIA, still seems to have Obama’s ear. But what can Obama do now? Shoot down a Russian jet and thereby endanger any U.S. pilot flying in Syria or near the Russian border? Risk a war with Russia? Really? The Russian hits at Tanf and the U.S. proxies there has an additional benefit. The U.S. had planned to let those forces move north towards Deir Ezzor and to defeat the Islamic State in that city. Eventually a “Sunni entity” would be established in south east Syria and west Iraq under U.S. control. Syria would be split apart. The Syrian government and its allies will not allow that. There is a large operation planned to free Deir Ezzor from the Islamic State occupation. Several hundred Syrian government forces have held an isolated airport in Deir Ezzor against many unsuccessful Islamic State attacks. These troops get currently reinforced by additional Syrian army contingents and Hizbullah commandos. A big battle is coming. Deir Ezzor may be freed within the next few month. Any U.S. plans for some eastern Syrian entity are completely unrealistic if the Syrian government can take and hold its largest eastern city. The Obama administration’s delaying tactic will now have to end. Russia will no longer stand back and watch while the U.S. sabotages the ceasefire and supports al-Qaeda. What then is the next move the U.S. will make? Dmitri Medvedev: You know, as I was heading to this conference, I had a feeling that the situation in this area is very complex and challenging because we have yet to come to an agreement with our colleagues and partners on key issues, including the creation of a possible coalition and military cooperation. All interactions in this respect have been episodic so far. That said, I note that here, in Munich, Russian Foreign Minister Sergei Lavrov met with Secretary of State John Kerry, and other colleagues acting in various capacities later joined them. They agreed on what should be done in the short run. For this reason, I’m cautiously optimistic about the prospects for cooperation on this issue. Let me emphasise that this cooperation is critical, because unless we come together on this issue, there will be no end to the war in Syria, people will keep dying, the massive influx of refugees to Europe will continue, and Europe will have to deal with major challenges. Most importantly, we will be unable to overcome terrorism, which is a threat to the entire modern civilisation. Second, there is a legal foundation in the form of the request by President al-Assad. We will therefore take these two factors into account in our military decisions and, obviously, the developments in the situation. What matters most at this point is to agree on launching the talks between all the parties to the Syrian conflict. Another important thing is to coordinate a list of terrorist groups, since this issue has been a matter of endless debates on who’s good and who’s bad. This is the first point I wanted to make. My second point is the following. 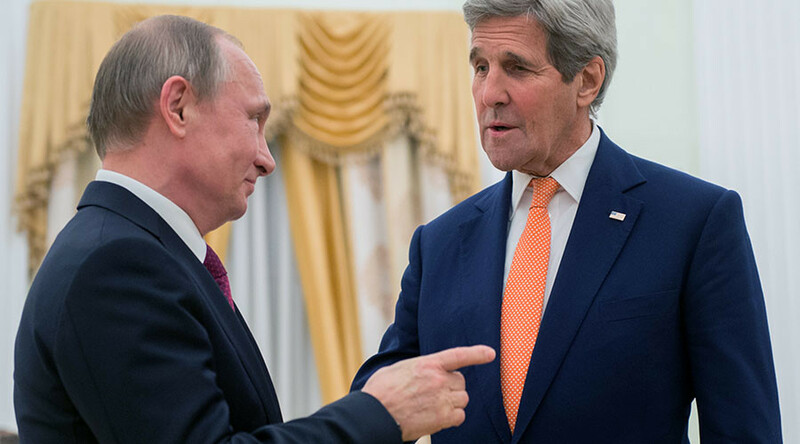 I learned that Secretary of State John Kerry said that if Russia and Iran do not help, the US will be ready to join other countries in carrying out a ground operation. These are futile words, he should not have said that for a simple reason: if all he wants is a protracted war, he can carry out ground operations and anything else. But don’t try to frighten anyone. Agreements should be reached along the same lines as Mr Kerry’s conversations with Mr Lavrov, instead of saying that if something goes wrong, other Arab countries and the US will carry out a ground operation. Isabelle Kumar: Are you therefore already working on ideas of political transition now in Syria? Dmitri Medvedev: I don’t think that we should go into too much detail on these issues. I’m talking about Russia, the European Union and the United States. We should focus on facilitating the launch of this process. We must make sure that everyone sits down at the negotiating table, in fact, make them talk to each other. Let’s be honest and recognise that it will be anything but simple given the parties involved. On one side, you have President al-Assad, supported by a part of society and the military, and, on the other side, the other part of society, often representing different confessions, people who don’t like al-Assad but have to sit with him at the same negotiating table. Nevertheless, they need to come to an agreement for the sake of keeping Syria united. Isabelle Kumar: I’d like now to switch focus and look at the conflict in Ukraine. We talk of the frozen conflict there with, it appears, renewed fighting in the east. What can Russia do to bring about the thaw in that conflict, to bring an end to this conflict? Dmitri Medvedev: Well, understandably, the answer here is somewhat easier than in Syria’s case. It is not just because this conflict is not as brutal, but because there is a clear understanding of how to move forward – by implementing the Minsk Agreements. They should be implemented fully and in their entirety by all the parties. In fact, Russia calls on all the parties to do so, both those in power in the southeast, and the Kiev authorities. It is not a matter of Russia having some disagreements with Kiev or mutual dislike. It would be fair to say that most of the provisions that were the responsibility of southeast Ukraine have been fulfilled. Most importantly, hostilities have ceased almost completely. Unfortunately, some action takes place from time to time, but not often. Finding political and legal solutions in keeping with the Minsk Agreements has now become vital. Whose responsibility is it? Of course, it is Ukraine’s responsibility. If Ukraine regards the southeast as part of its territory, it is within the jurisdiction, competence and authority of the President, Parliament and Government of Ukraine. Isabelle Kumar: If you meet President Poroshenko here, at the Munich security conference, what will you say to him? Dmitri Medvedev: I haven’t seen him and, to be honest, I haven’t missed him. President Poroshenko is in contact with President Putin. There is no doubt that the main thing my colleagues should undertake is to do everything it takes to implement the Minsk Agreements. It would benefit them, as well as the Ukrainian state, which, no matter what anyone says, is a close, neighbouring country for Russia. Isabelle Kumar: Obviously, one of the major sticking points in this, for Ukraine, but also for the international community, is Crimea. Is the future of Crimea up for negotiation? Dmitri Medvedev: No, there is no such issue for Russia. This issue was settled once and for all. Crimea is part of Russia. A referendum was held there, we amended the constitution. The Republic of Crimea and the city of Sevastopol are part of the Russian Federation. Isabelle Kumar: So the conflict in Syria, the situation in Ukraine has contributed to a real degradation of relations with Russia, with the EU and the US. Do you think a reset is possible? Dmitri Medvedev: The question is how and for whose sake. If something is to be reset, it should be done on a fundamentally different basis. What kind of basis? Equitable, fair, solid basis for relations, considering that Russia is not the only nation that needs this – the European Union and the United States need it as well. We want sound, advanced relations both with the United States and the European Union. The European Union is our most important trade partner, a group of countries located on the same continent as us, so we are bound by our shared European identity, history and values. These continuing tensions aren’t doing us any good. But if we are told that they no longer want us around, of course, the first steps towards reconciliation should be taken by those who initiated the alienation. As for us, we are ready to discuss any issues. Isabelle Kumar: Well, one of the repercussions of the souring of relations has been the sanctions that have been imposed on Russia, which are hitting hard. How much of a priority is it for your government to get those sanctions lifted? Dmitri Medvedev: They told us we were the bad guys and had to be punished. And then they made some calculations and began to weep: it turns out that for some reason it was hitting their own business. We had a trade turnover with the European Union at 450 billion euros. It was 450 billion! Now it is down to 217 billion euros. Why don’t they ask the people in the EU who are employed by the various companies that used to make products for Russia – how do they like all of this? Again, we are not the ones who started this, so it is not up to us to undo it. They have always been trying to intimidate us with some sanctions, which were introduced even in the Soviet period, many times. It never brought them anything but lost profits. What is happening now is no different. They will have to have the courage to say, guys, we’ll just scrap all this from day X, and could you please reciprocate by lifting your response measures as well. That would be the right approach. Isabelle Kumar: So how are ordinary Russians feeling this economic crisis? Because the sanctions are contributing towards this, the falling oil prices are also contributing to this. What’s it like for ordinary Russians? Dmitri Medvedev: Indeed, we aren’t in the best economic situation right now, with the dramatic fall in oil prices probably contributing the most to the overall state of the economy, to the decline in revenues. This is something we haven’t seen for 17 years. The current prices are comparable to those in 1998. Unfortunately, our budget remains very dependent on oil prices. Although the structure of revenues has been improving, in terms of the share of oil and other sources, but yes, it remains commodity-dependent to a great extent. This could not but affect the incomes and the general standing of our people with their jobs and their real incomes. The sanctions have had some effect as well. This is obvious, since some of our companies, for example, lost the financing they used to have from European banks, which means they cannot grow, some of them anyway. Therefore, in this sense, the economic situation is not the easiest. But there is also a positive effect. The economy is healing, it is becoming less dependent on oil, and we have an opportunity to develop our own industry and agriculture. Perhaps one of the advantages of these sanctions and our response measures is that we started concentrating harder on domestic agriculture, so, to a large extent, we are now satisfying our demand for food, while wheat, for example, is now exported in large quantities. In this sense, the sanctions have helped. But they probably didn’t help farmers in the European Union. Isabelle Kumar: I was asking about the ordinary Russians and how this was affecting them. And we hear of possible social unrest as their lives become more and more difficult in Russia. Is that something you are concerned about? Dmitri Medvedev: Of course, the government must first of all think about the social impact of economic changes and the economic situation. Frankly, we have been compelled to cut budget spending in many areas, but we never touched social spending, or the public sector wages and benefits. Moreover, we even indexed pensions last year, and this year, too, maybe not completely, but we did. We will try to continue doing this in the future. That is, the government’s social spending is large, but it is inviolable. In this sense, we will try to do everything towards Russian citizens’ social wellbeing, to keep them as comfortable as possible under these conditions. It is truly a priority for the government. Isabelle Kumar: If we take an international perspective once again, a black mark on Russia’s reputation is the issue of human rights and freedom of speech, which Russia seems to continually backslide on. Why is that? Dmitri Medvedev: To be frank, we’ve always differed in our views on the situation with the freedom of expression and the media in Russia. We’ve often been criticised and we are still coming under criticism. We have our own position on the issue. Perhaps in Russia, the media are somewhat different, for example, from the European media. There are historical differences and there are growth issues. I rarely watch TV or read newspapers in print and I receive virtually all of my information from the Internet. And over half of Russia’s population does the same. As you know, on the Internet, there is no regulation in this sense. All points of view are represented there, including, to put it bluntly, even extremist ones. So I believe it’s not serious to think that some people have no access to different kinds of information in today’s global world. Isabelle Kumar: Yes, but also it seems that dissidents are silenced. In Britain, as you know, there has been – the results of the inquiry into the murder of Alexander Litvinenko, which the inquiry said – it pointed the finger at President Vladimir Putin, saying that it was likely that he ordered that murder. Will you be pursuing the British Government on this? There was talk of you suing the British Government over this inquiry. Dmitri Medvedev: You’ve mentioned some report by some retired judge, in which practically every paragraph and each section opens with the word “probably”. What is there to comment on? What is regrettable about this whole story is that the British Prime Minister and the Foreign Secretary comment on a report that abounds in words like “probably”. This is reminiscent of a witch-hunt. When all is said and done, let it be on the conscience of the commentators. As for any legal action, this is simply ridiculous. We don’t need this and the Russian Federation will never sue any country over some foolish fabrications or funny films. Isabelle Kumar: Finally, Mr Prime Minister, you’ve held the post of prime minister and also held the presidency, so you’ve got an overview, a full perspective of the issues we’ve been talking about, but if I were to ask you about one of the highlights of the your time in power, could you say what that’s been? Dmitri Medvedev: Well, there’ve been plenty. Both these posts are very serious and challenging. These eight years of my life – and it has been almost eight years – you know, it’s this constant drive. As for events, there have been plenty, both in Russia – very good ones for me personally, notable, major, and sometime tragic events, like the ones we’ve been talking about now, and international events. After all, we have not only argued and quarrelled. We’ve also accomplished a thing or two. For example, at some point we agreed on a New Strategic Arms Reduction Treaty. That was not bad at all. The document was signed. It is in force. It is being implemented and therefore we can work together and agree on different things. There have been contacts with my colleagues, including here in Germany, as well as in other European countries. We have dealt with a lot of issues. All of this is remarkable and exciting. Maybe one day I’ll talk about this in detail. For the time being I continue working and this work is interesting. Prime Minister, many thanks for joining us.